HOUSTON (AP) — The Carmelo Anthony experiment in Oklahoma City didn’t go well last season. Anthony balked at the suggestion he would come off the bench for the Thunder had he stayed. He still doesn’t want to talk about the possibility of a reserve role in Houston, but he seems to have made peace with playing with the second team if it means he might finally get a ring in his 16th season. “At the end of the day whatever I have to do to help this team win a championship, then that’s what’s going to be done,” Anthony said. Anthony was traded to the Hawks after one tough season with the Thunder, where he averaged a career-low 16.2 points in 78 starts. Atlanta released him to clear the way for him to sign with the Rockets. 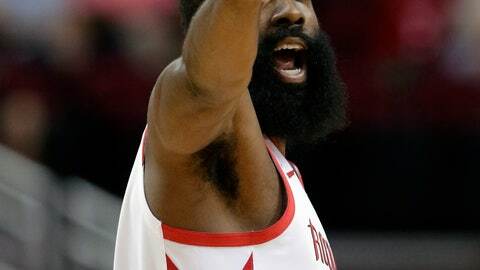 The fresh start has the 34-year-old rejuvenated and finding joy in the game again as the Rockets look for their first championship since winning back-to-back titles in 1994-95. “My focus level when it comes to playing basketball and working and trying to win a championship is at a high level,” Anthony said. That’s music to the ears of D’Antoni, who at 67 is also still chasing his first title. “So I think we’re in a good place to try to maximize everybody’s talents to try to win,” D’Antoni said. The Rockets open their season at home Oct. 17 against New Orleans. Harden led the league by averaging a career-best 30.4 points last season to become Houston’s first MVP since Hakeem Olajuwon in 1994. D’Antoni doesn’t see how Harden could get better. But he’s eager to see him try. Houston’s defense took a hit in the offseason when free agent Trevor Ariza signed with Phoenix. D’Antoni said he is confident his team will be able to build on last season where the Rockets allowed the seventh-fewest points in the league. He said new additions James Ennis and Michael Carter-Williams will help pick up the slack, and noted Eric Gordon and P.J. Tucker are very good defenders. Clint Capela signed a five-year, $90 million contract to stay with the Rockets and his teammates were quick to tell him they expect the 24-year-old center to play like a seasoned veteran this year. After eliciting some laughs with that comment, Paul continued. Capela has steadily improved in each of his four NBA seasons and finished with career-bests in points (13.9), rebounds (10.8) and blocks (1.9) while starting a career-high 74 games last year. Paul and Harden erased any doubts that they would play well together by working brilliantly in their first season as teammates last year. With that experience under their belts, they’re eager to do even more this season. Paul was looking forward to increased chemistry not only with Harden, but the rest of the team, too.